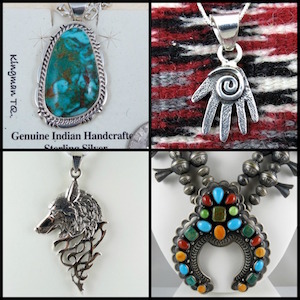 Native American Indian jewelry store featuring natural turquoise, pendants, earrings, bracelets and rings. In addition to our online offerings, we have an even larger selection in our store in Hendersonville, NC. This is just a sample of what we have, contact us and tell us what you might be looking for. 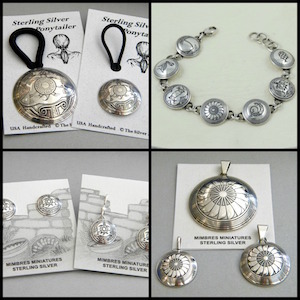 Sterling Silver pendants and necklaces in all different price ranges and sizes. 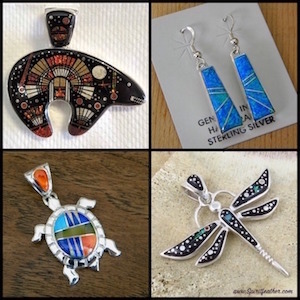 You can also find pendants under High Quality Inlay Jewelry, Bone Feather Jewelry and Mimbres pages. A collection of earrings in different price ranges. 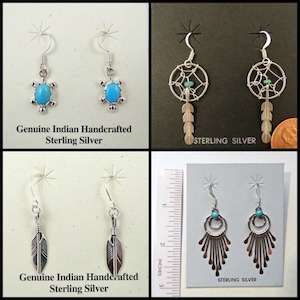 You will also find earrings under Inlay Jewelry, Bone Painted Feathers and Mimbres categories. You can always ask me for photos as our website is only a small portion of what we have. 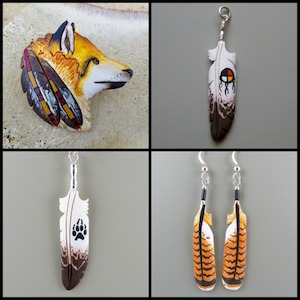 Native American Indian buffalo bone painted feather jewelry. Please look at the detailed view to appreciate the detailed work. You will see small little feather lines carved in each piece. Truly amazing detail! Lumbee and Sioux made. Gorgeous cuff and link bracelets. 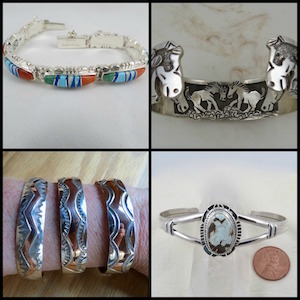 Sterling Silver cuff bracelets in all different price ranges and sizes. 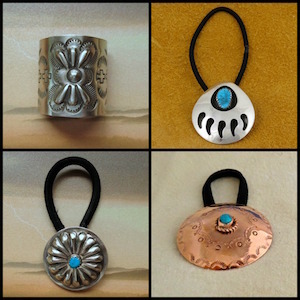 You can also find bracelets under High Quality Inlay Jewelry and Mimbres pages. Sterling Silver Pony Tailers or Hair Ties You can change the elastic band any time and it's so easy, done in just a second. Unisex, popular by both men and women. Nothing Better than Gorgeous Natural Turquoise from North America!